I write because when I write blood runs on to the page and forms rivulets that merge into an ocean. A sea – a jumble of words with all their twists, turns, curves and corners. Words that sit together comfortably like old grandmothers. Words that curl around each other, scaly like lizards’ tails. Words that talk, words that sing. Threads like guitar strings, each a unique note that resonates on the page. I write because I need to, because my heart beats louder when I think about it. I write because writing is my romance, the love affair I have been engaged in since childhood. I write because it’s magic, because I weave a tapestry of words and images that weave their own stories. I write because it is how I connect to my inner source, my creative consciousness, the essence of the universe, the hidden within, the core. 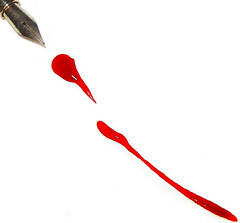 I write because I love the flow of the ink from the nib, from my fingers, from my arm, from my brain, from my heart. I write because I am writing, I am spilling, I am bursting through the present moment and pushing into the next. The edge of this moment stretches like a piece of elastic that splits and the next moment is born – a painless labour. I write because it’s a thread that has run through my life – one I always pick up again, each time with a renewed intention and inspiration. I write because this is how I have recorded my life – through volumes of journal that I have kept since I was young. The books I have filled in the last 8 years chronicle the journey of my life as a seeker, a spiritual practitioner, a lover, a wife and a mother. I write because I want to share my dreams and my inner world with my future self and with whoever wishes to tune into my radio.